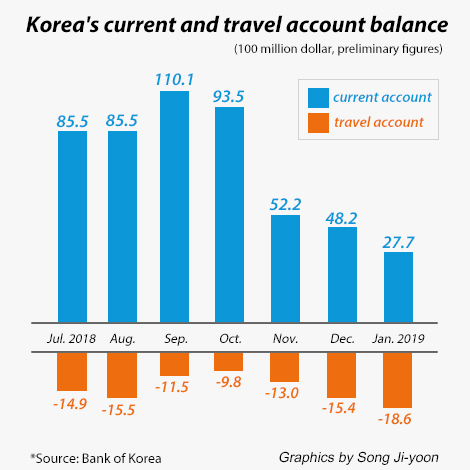 South Korea’s current account surplus in January was trimmed to its smallest in nine months due to faltering chip sales and reduced shipments to its largest trading partner China. The current account surplus of Asia’s fourth-largest economy narrowed to $2.77 billion in January from $4.82 billion in the previous month, according to preliminary balance of payments data released by the Bank of Korea on Friday. The country extended its surplus streak that began in May 2012, but the surplus was the smallest since April last year when it stood at $1.36 billion. The goods account surplus narrowed to $5.61 billion, the smallest since February 2018. Exports were down 5.4 percent on year at $49.4 billion, falling by the fastest pace since last September. While shortened business days due to the Chuseok holiday were largely to blame for the September drop, the recent decline was chiefly driven by falling prices of mainstay export items, namely semiconductors, explained the central bank. When accounting for this factor, it is the first time for the country to see an on-year fall in goods exports since October 2016. Shipments of chips and petrochemical products dropped 22.6 percent and 4.6 percent, respectively, from a year earlier. Korea’s exports to China were off 19.2 percent amid rising concerns of an economic slowdown in the world’s second largest economy, exacerbated by the ongoing trade war with the U.S., the world’s biggest economy. Exports to the Middle East also slumped 26.6 percent as the region is faced with declining oil prices and political unrest. Imports fell 2.0 percent to $43.8 billion due to the lower price of global crude and reduced spending on machinery and other capital goods. The service account deficit was stretched to $3.61 billion, the largest amount since January 2018. The deficit in travel account reached $1.86 billion, despite an uptick in Asian tourists. Chinese and Japanese visitors to Korea were up 28.7 percent and 23.6 percent, respectively, compared with the same month last year.